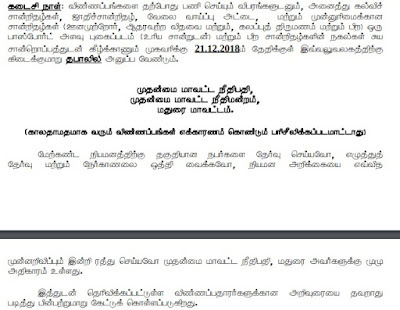 Madurai District Court Recruitment 2018 2019 | Madurai District Court invites Application for the post of 160 Office Assistant, Computer Operator, Senior Bailiff, Xerox Machine Operator, Gardener & Sanitary Worker Posts. Madurai District Court Office Assistant Jobs Notification 2018 Released. Candidates are requested to Download Application through Official website http://ecourts.gov.in/tn/madurai. Opening Date and time for Submission of Application is 07.12.2018 and end up by 21.12.2018. You can check here Madurai District Court Recruitment Eligibility Criteria, Pay Scale, Application Fee/Exam Fee, Madurai District Court Selection Process, How to Apply, Madurai District Court Syllabus, Madurai District Court Question Paper, Madurai District Court Admit Date Release Date, Madurai District Court Exam Date, Madurai District Court Result Release Date & other rules are given below… Aspirants are requested to go through the latest Madurai District Court job recruitment 2018 fully, before applying to this job. As per the recent Madurai District Court notification 2018, the eligibility details like Educational Qualification & Age Limit for the Office Assistant job has given below. 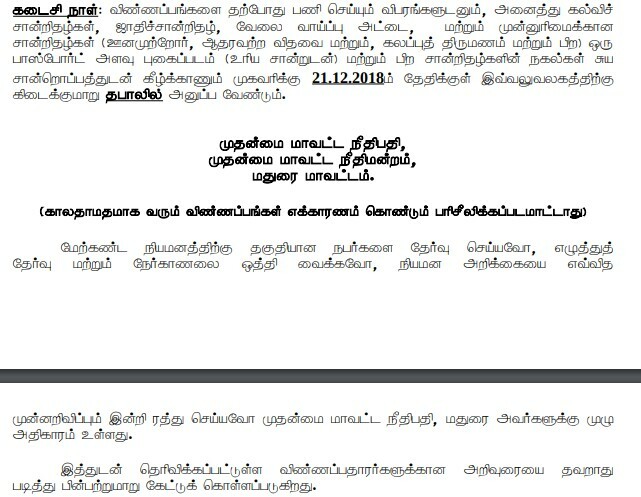 A Pass in Bachelor’s degree in Computer Science / Computer Applications from a recognized university of Indian Union or a Bachelor’s degree in B.A., or B.Sc., Or B.Com., from a recognized University of Indian Union with a Diploma in Computer Applications from a recognized University + Typewriting both English and Tamil by Junior Grade/Lower Grade. VIII Std passed and Driving License for driving a motor vehicle issued by the competent authority under the Motor Vehicles Act 1939 (Central Act IV of 1939) with practical experience of driving Motor vehicle for a period of not less than 5 years. Madurai District Court may follow the following process to select the candidates. How to apply Madurai District Court Office Assistant Vacancy?